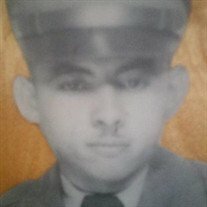 Domingo Gonzalez, age 83, of Lorain, passed away Thursday, January 17, 2019 at his residence while under the care of Stein Hospice following a lengthy illness. Born November 15, 1936 in Arecibo, Puerto Rico, he lived in Florida before coming to Lorain in the early 1980's. He was a member of Iglesia de Dios Casa de Oracion, Lorain. Domingo enjoyed playing his guitar, gardening and he loved animals. Surviving is his wife of 59 years, Rosa (nee Soto); a son, Jose of Lorain; daughters, Rosa Gonzalez of Cleveland and Iris Sanchez of Lorain; 8 grandchildren and 12 great grandchildren; brothers, Feliciano and Juan all of Puerto Rico; and a sister, Beatrice Gonzalez of New Jersey. He was preceded in death by his parents, Justo and Regina (nee Centeno) Gonzalez; and a brother, Santos; sisters, Otilia Gonzalez, Maria Gonzalez and Fermina Gonzalez. The family will receive friends on Sunday from 2:00 pm to 6:00 pm in the Dovin Funeral and Cremation Specialists, 2701 Elyria Avenue, Lorain. The family will also receive friends on Monday from 9:00 am until the time of funeral services at 10:00 am at Iglesia de Dios Casa de Oracion, 1600 E. 34th Street, Lorain. Burial will follow in Ridge Hill Memorial Park, Amherst Twp.